One of the biggest expenses that our customers complain about is unnecessary costs on food! Eating out, wasted money on groceries and more really mess with your budgets. Here are a few things to keep in mind the next time you open the fridge and realize it’s time to make some grocery purchases. 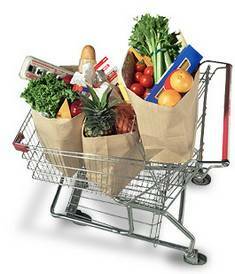 This is the number one way to save some extra money at the grocery store: know what you want before you go there! Get an idea of the kind of meals you want to make and all the necessary ingredients. Some meal planning will go a long way towards lower bills and a more functional fridge. Actually write down what you want to get (and how much of it) and your trip to the grocery store will even take less time! After you plan the meals and have a list, know what you’re ready to spend. Following a few successful grocery shopping trips, you’ll have a much better idea of how to budget your food costs – but get started and keep a rough tally in your head as you shop up and down the aisles. Sometimes it’s ok to get some extras – especially when staple (non-perishable) items go on sale. When you can get a great deal on canned goods, toilet paper or toothpaste, it can be a great expense. You’ll save time later, and save cash now. http://www.e-mealz.com/ and http://tastyplanner.com/ are great places to go to start planning meals, looking at grocery lists and hearing what works well for other users. Getting the most out of mealtime saving just takes a bit of pre-planning. Enjoy the meals, and the extra bucks in your pockets. Bonus Tip: Don’t shop hungry! Have lunch before you go, and you’ll knock out a lot of those ‘impulse purchases’, just because your stomach is rumbling!